This is very nice video, you will likely have seen a few videos on Clark Little, but this one, produced by The Inertia, is the best yet from a photographers perspective. There’s no detailed break down of equipment, but from a pure eye candy angle it’s hard to beat and there’s some more details on the kit he started out with when just beginning to shoot in the water. CREATORS: Clark Little on Staring Down Shorebreak for The Perfect Shot from The Inertia on Vimeo. Interestingly the action footage is mostly archive stuff I think because all the gear he’s using is SPL or Water Housings Hawaii, and recently I noticed he was using an Aquatech housing on his latest social media updates. this just goes to show that the gear you use isn’t the most important factor, especially when he shows you his original set-up, a Canon point and shoot with a $150 Canon housing. I’ve used almost this exact set-up before too and been happy with the results, so if you’re on a budget you could do a lot worse than picking up something like the Canon G series with an inexpensive dive housing, it’ll give you a taste for shooting in the water at least, and provide a really good quality all-round camera for regular photography too (more so than a GoPro which is probably what Clark would have started out with had it been available). Check out other posts on learningsurfphotography.com which feature Clark little here. 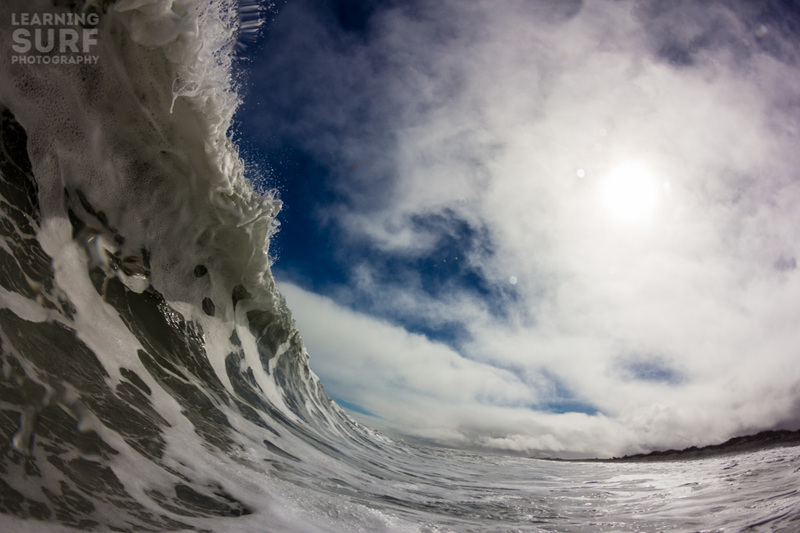 Here’s one of my most recent fisheye shorebreak shots from a session in New Zealand, shortly after this was taken I swam back in and got my board, glacier run off water isn’t much fun to swim in and the sun was pretty high in the sky anyway. That splodge on the left is because I’d only just got in when this wave came through so I hadn’t done enough spitting on the dome port to get it to run off properly in that area, turns out glacier water is pretty cold, and although my 3mm was warm in the North Island this far South it’s a bit chilly when you’re just bobbing in the impact zone.